The Somali, Digil-Rahawiin are an ethno-linguistic Maay-speaking people who are found primarily in the Lower Jubba Valley of central Somalia, between the Shabeelle and Jubba Rivers and south of the Jubba River. They makeup the Digil and Rahawiin peoples. The latter name is often spelled Rahanweyn or Rahawin, following the Northern Somali pronunciation. Mirifle is another name used fairly interchangeably with Rahawiin. Because their language is called Maay, they are sometimes called the Maay people. The Somali-related peoples accepted Islam in the 1400s, or perhaps even as early as the 1200s. Sufi mystical orders and practices are prominent in the Islam of Somalia. Their commitment to Islam has led to the development of legendary claims of lineages in the Arabian Peninsula, but these claims are not supported by linguistic evidence and other oral traditions. They are Sunni Muslim in profession, but paradoxically their family and clan identities take precedence over the claims and values of the Muslim faith. 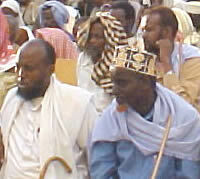 It is common for Somalis to refer themselves as Arabs. Pray God will send Christians to minister among the Digil-Rahawiin who are well versed in Islam and sensitive to their Muslim culture and religion. Pray these Christians will have patience and perseverance. Community is extremely important among the Digil-Rahawiin people with Islam reinforcing community adherence. Therefore, pray God will work among the leaders, giving them dreams of Jesus Christ that leads them to ask Christians about Jesus Christ. Pray for Christians as they seek to share a gospel presentation in their heart language.